Webaroo is an Indian company who introduced a new idea of saving internet and web pages for offline access . They have both desktop and mobile Webaroo applications for saving web pages ,images etc. as special packs into a library which can be accessed later without an internet connection . Website and image packs for Wikipedia ,Flickr ,National geographic etc . are available for manual download . Download Webaroo Java mobile application to save web pages for offline view . 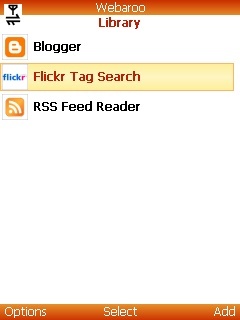 You can add Flickr tags to download images falling in that category . Another option is there to add web/blog feeds . All contents will downloaded and saved to library for offline view .